My baby, my ride…sweet little silverblue nishiki roadbike (and i do mean small). with orange leather duct-taped seat, dirtier than she deserved to be, straight bars and a funny brake accelerator, rear rack and green pannier full of ratty raingear. I had her for 2 years, rode her thousands of km, but she came to me with over 100,000 city courier km under her wheels. I gave her new wheels but couriers would still ride up behind me downtown and say hey! isn’t that Lana Fox’s bike? 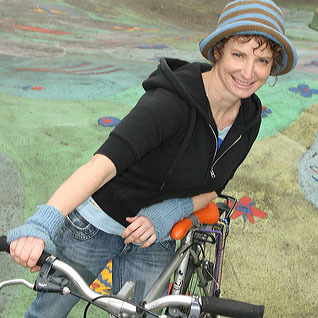 She was a personality in the bicycle world. I cry to think of her in a shopping cart, trundling through a DTES back alley. I am grateful for all the pleasure she gave me, so much lightness, freedom and speed.